Three people died after their vehicle, traveling northbound on State Route 347 near Maricopa Road, lost control and crossed into opposing traffic lanes was struck by a semi-truck around 4 a.m. Sunday, according to Gila River Police Department. Two other passengers and the semi-truck driver were transported to nearby medical facilities with non-life threatening injuries. 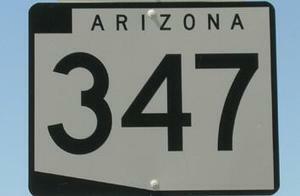 It was the second fatal accident on SR 347 in just four days. A 34-year-old Phoenix man was killed in a head-on collision with a tow truck on State Route 347 early Thursday. Two fatal accident at or near the intersection of Riggs and 347. WHY. The intersection has traffic lights. Both accidents were caused by cars crossing over to the other lane. After reading the news information, it sounds as if cars crossed the ample green strip between the lane which include a deep ditch.